THE NCAA, NAIA, and the STUDENT-ATHLETE For sheer complexity, there’s nothing quite like the NCAA rulebook. It’s as fat as the Manhattan Yellow Pages, as complicated as the U.S. Tax Code, and as daunting as War and Peace. These rules are summarized in the annual NCAA Guide for the College-Bound Student-Athlete. This book is important for three reasons: 1. It explains the core course and test requirements for eligibility to over one thousand colleges and universities. 2. It explains the process of registering with the NCAA Eligibility Center. 3. It explains the rules of when and how college coaches can recruit students. Fortunately, parents and athletes are only required to know and understand a portion of the rules, though it is critical to understand the recruiting regulations. College coaches must memorize every rule in the book, from early recruiting contacts to whether they can give players money to fly home to see parents during holidays (they cannot). In the following pages, we will focus on the key rules regarding recruiting. We will also show how to avoid the pitfalls that have gotten so many athletic programs, especially football and basketball, in hot water with the NCAA. The NAIA and the NJCAA A significant number of smaller schools belong to the National Association of Intercollegiate Athletics, or NAIA. The NAIA’s rules regarding athletic scholarships are designed to level the playing field among its divisions. That is not to say that attending an NAIA school and playing sports is a lesser experience; indeed, many NAIA programs are highly competitive with NCAA teams and are academically excellent. These schools have simply chosen to compete in a less-restrictive and generally less-expensive environment. Another organization unaffiliated with the NCAA is the National Junior College Athletic Association (NJCAA), which is comprised solely of twoyear schools. Junior colleges are generally for students and athletes whose grades are not NCAA-caliber or who simply need a comfortable stepping stone to bridge the wide gap between high school and a four-year college. Most athletes spend the full two years at a junior college—often referred to as a “JC” or “juco”—but many play just one year, make the necessary grades, and move up. Juco schools are often less competitive, which means student-athletes can improve their skills in preparation for a position on a team at a four-year college or university. The NCAA overseas more than 400,000 athletes at one thousand member schools from coast to coast as well as Alaska and Hawaii. Over the years, the organization, once based in Kansas but now in Indianapolis, has grown to consist of three distinct divisions: Division I, Division II, and Division III, commonly known in athletic jargon as D-I, D-II and D-III. NCAA DIVISION I To be a Division I program, schools are required to meet minimum stadium-capacity and attendance (fifteen thousand at least once every two years) standards. Approximately 350 schools are categorized as NCAA Division I. In football only, Division I is split into two categories. Known as Division IA and Division IAA, these divisions have technically been distinguished as the Football Bowl Subdivision (FBS) and Football Championship Subdivision (FCS), respectively. « « Fa s t Fac t « « Division I teams are segregated into two categories in football only. Commonly called Division IA schools, schools in the Football Bowl Subdivision are larger schools while schools in the Football Championship Subdivision (Division IAA) are smaller. scholarships. This division, and all other levels in college football, determine a national champion via a playoff system involving sixteen teams. In 2007, the FCS’s Appalachian State made national headlines by upsetting traditional FBS powerhouse Michigan. Appalachian State went on to win the national title over Delaware in the playoffs. Exceptions in FCS, which include Ivy and Pioneer League schools, do not participate in postseason playoffs and use a Division III-philosophy toward scholarships. Ivy League grants-in-aid are given based purely on need, and such institutions do not offer athletic or academic scholarships. In fact, these “non-scholarship” schools are excluded from post-season play in the FCS. Division I schools are segregated only in football. In all other sports, including basketball, all Division I schools compete against each other and determine a national champion through a playoff system. The bigger schools whose football teams compete in Bowl games are called “major” programs and the teams from smaller Division I schools are labeled “mid-major.” On the playing field, though, they are considered equals. Better-known examples of “mid-major” programs in basketball are Gonzaga, Davidson, and Nevada. « « Fa s t Fac t « « Except in football, all Division I teams compete against each other. Though bigger schools are considered “major” programs and smaller Division I schools are considered “mid-major” programs, on the field they are considered equals, with “major” teams playing “mid-major” teams. Some Division IA programs will play Division IAA programs (for example, Appalachian State beat Michigan). •	Minimum SAT (in math and critical reading) of 1000 or minimum sum score of 85 on the ACT. •	For Division I, a core course grade-point average of at least 3.0 with at least thirteen core courses, including three in English, two in math, two in science, and six in additional core courses. •	For Division II, a core course grade-point average of at least 3.0 with at least twelve core courses, including three in English, two in math, two in science, and five in additional core courses. Early certification accomplishes two things: 1) it allows coaches to feel early peace of mind that the student-athlete is qualified to play; and 2) it alerts coaches that the student-athlete is accomplished academically. Remember that an athlete must register with the NCAA Eligibility Center after the junior year, even if the athlete does not qualify for early certification. For more information about the NCAA Eligibility Center, visit www.athleteswanted.org. 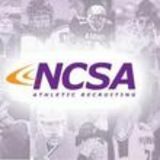 To win the recruiting game, an athlete must know the rules of each regulatory committeeâ&#x20AC;&#x201D;the NCAA, the NAIA, or the NJCAA. 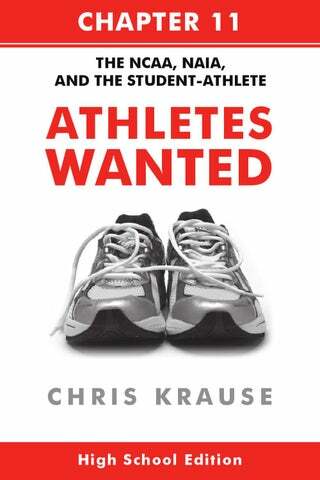 The NCAA Guide for the College-Bound Student-Athlete is a great place to start. The NCAA breaks schools into three divisions. Each division has its own regulations regarding time restrictions, official visits, phone calls and other communications, and the like. Not knowing or failing to comply with the rules can cause a studentathlete to lose eligibility. Early Certification through the NCAA Eligibility Center alerts college coaches that a student-athlete is on schedule to meet NCAA qualifications to be eligible.